While some try and complicate greywater with lots of gadgetry and contributions to gross domestic product (GDP) through consumption, it should be approached with radical simplicity when contextually available. What prevents the radically simple, as greywater leader Art Ludwig puts it, implementation is extremely sandy soils that would leach straight into groundwater or heavy clays that will not drain. Also as greywater laws are made legal, county boards do require more sophisticated systems to meet code standards. To avoid that the simple bucket in the sink or shower that catches most of the water can be taken to a banana circle (pit garden) located in relative location from the kitchen. As Art says, most of the worlds greywater system is a pipe out the back but we can improve this one to make the energy cycle appropriately and make elements like banana circles even more multifunctional..
it is there non the less. Basically the quality of water and its flow possibility is matched to a landscape feature that ensures water will be cleansed before adding to groundwater supplies. Newer systems need more interaction and like all perennial systems they take some time to settle in. 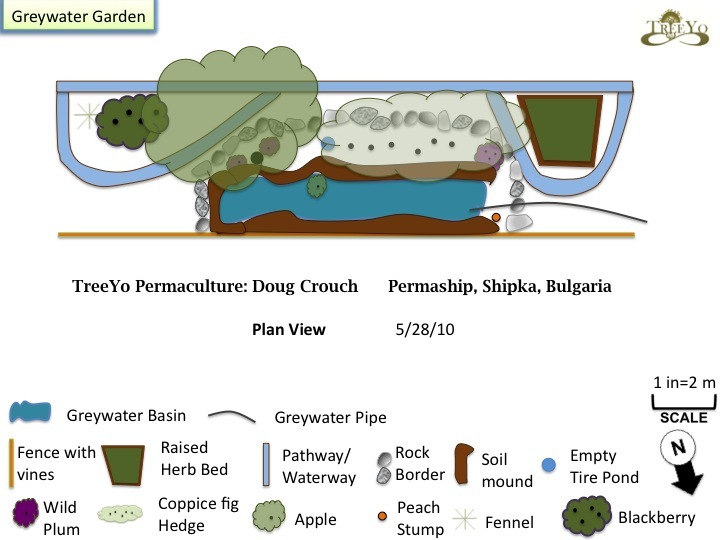 Below is a picture of a greywater system that I used while working on a farm in 2008 in Northern California. 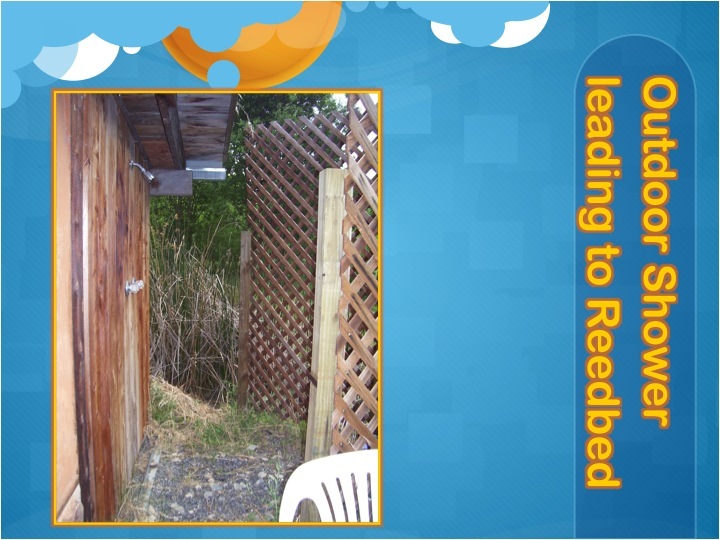 It is an outdoor shower that leads through a gravel bed to a reed bed before possibly entering into the pond. 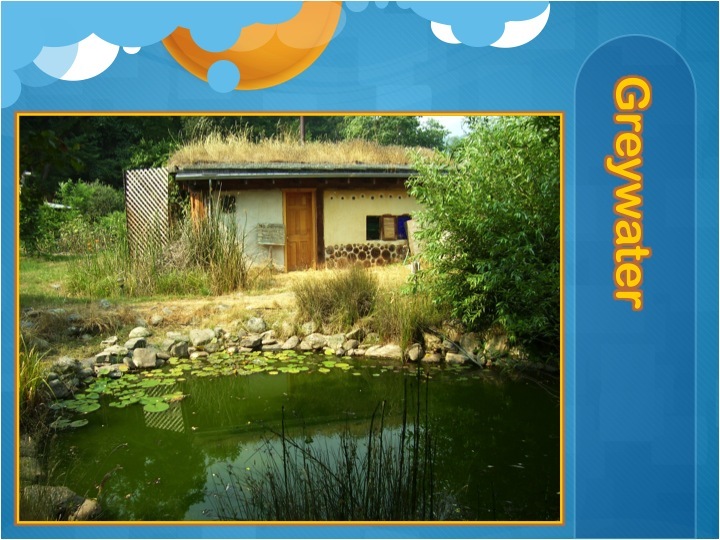 Greywater systems do not need to lead to a pond but sometimes do nor do they need to involve gravel. Often gravel clogs up with dirt and may hinder or help. Coarse gravel that is sharp is a good resource. Furthermore, to state clearly, the greywater systems I am advocating are not for water reuse in terms of drinking or domestic use but rather creating oasis zones from this extra input into the landscape. In this case the wetlands plants were being supported by the extra water and they were supporting the greywater system by filtering the water. Their roots, unique to wetlands plants, pump oxygen into the root zone thus keeping the atmosphere mostly aerobic. This allows a plethora of microorganisms to flourish as they are the true cleaners of greywater systems. Seen below from the other side, the gravel bed was the system for distribution but not essential. Getting all sophisticated with sand and gravel is not needed for the system to thrive when these radical simplistic ones are used. Rather its carbon and microorganisms that do the majority of the filtering. Carbon sources are plants roots and other decomposing organic matter with high carbon content like woodchips. These both give habitat for filtration through microorganisms and help with carbon to nitrogen ratios as greywater can be nitrogen rich when dealing with kitchen greywater. In fact some planning authorities consider this water source, the kitchen, blackwater because of its higher organic matter content. It’s true that this does stimulate bacterial growth which drops the oxygen content. When this happens pathogens can possibly flourish but can also be balanced by lacto-ferments like EM, bokashi, or even a little diluted fermentation water from sauerkraut oddly enough. Below are slides from Brad Lancaster and are a great example of creative human interaction and the principle multiple elements for the important function. In this case the filtration system for the greywater would be overloaded by having this flow just go to one space. However, through a simple, yet clever, alternating distribution system, the energy of waste water becomes a resource instead of a polluter. The laundry can be diverted to one of three trees and a simple system of moving the tube to the right each time laundry is done allows the balance to be reached. Genius really, and I have seen this time and time again with other high flows of energy like kitchen scrapes. Taking it to the same bin day after day and not adjusting accordingly creates a methane producing, maggot ridden, pile of putrified organic material rather than the desired outcome of compost. Similarly in greywater, salts can build up, basins become waterlogged, and pathogens breeding but the above system avoids this brilliantly. In this example below again from Brad Lancaster the system is part of a greater social system. 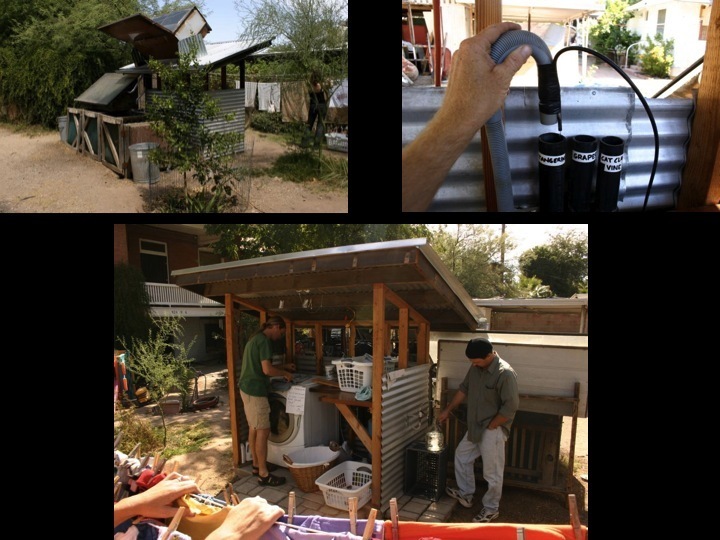 Greywater also flows from the communal water hole which is solar-powered laundry and reverse osmosis drinking water distribution point. Reverse osmosis bleeds one gallon of nearly distilled water for every gallon filtered becoming an extra source of greywater. Regardless this spot becomes an informal meeting spot and allows community issues to be discussed immediately rather than festering all week until the next communal meeting. This can greatly increase quality of life and a central water element in community is a very old design. Simple misunderstandings can be quickly reversed since interaction is facilitated and waiting till next weeks weekly meeting is not needed. This allows social system to progress as permaculture really is most about people. gadgetry. The main stressing point was that the pipe needs to fall 2% which was easily accomplished in this context after some concrete was broken, sand laid and pipe fitted. Then in the course we did the digging and planting of the basin. 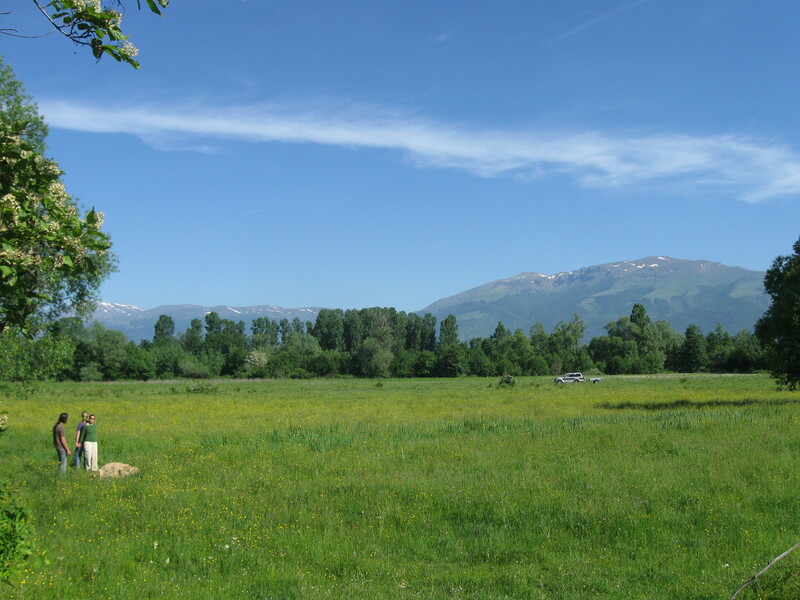 Procuring the diversity of plants was a fun trip to a mountain wetland in the Balkans, what a tough gig! But the earthwork was very basic, matching maximum outward flow of water from the all the sources. Greywater dictates this accounting and some simple math equations. 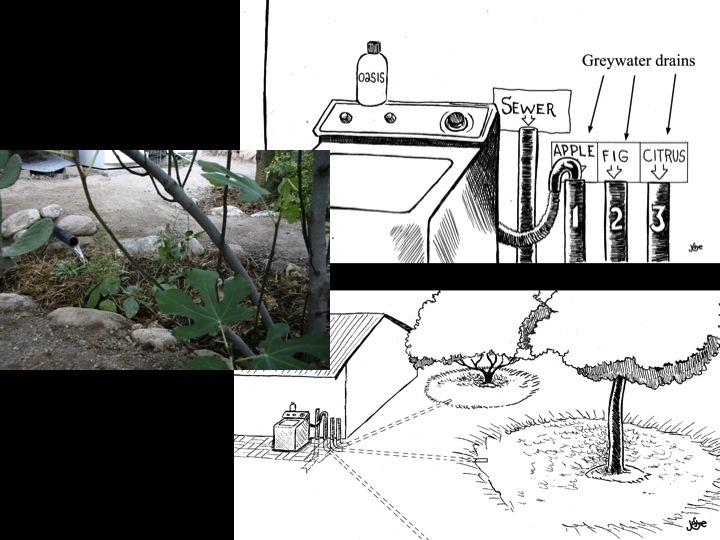 If every water source was to fill the pipes simultaneously (dish water drain pulled, toilets flushed, bath water drained, and toilet flushed, etc…) then the greywater must be sized to handle all of these flows. The above section view shows the simplicity of this earthwork, just a mere hole in the ground with carbon material and plants. In this one we elected to throw in a bird house as a complimentary element but in no means a need. Because of the clients wishes we added this element and always designs must meet the clients contextual needs along with climate and flow. Despite the fact that this was a cold climate in the winter, the system persists because of the warm water that flows out of the house. Also a winter time pee in the shower helps as the nitrogen input keeps the microbes happy and their movement and reproduction keeps heat going. In the plan view of the same design below you can see how we made a long earthwork to fit the appropriate size of the needed basin to the amount of flow from the house at this rare maximum flow. From where the pipe alighted and where we could get it to enter the garden after the concrete patio, this space made the most sense. 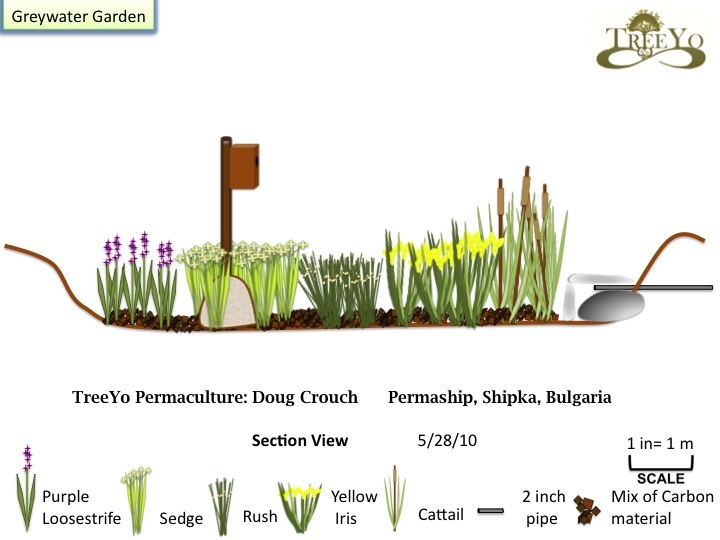 It would feed the wetlands plants we designed and planted in but the overall landscape where more trees where present. Having multiple layers helps to cycle the energy appropriately and make sure the systems longevity persists. Climatic differences persist for sure as greywater in the drylands allows you to grow species otherwise impossible without lots of supplemental watering. This is the case from above with Brad Lancaster’s slide depicting an apple tree being grown. When the tropics are encountered, systems to deal with all of the normal water and then this extra input needs to be accounted for. With that, the slide below shows species that we used in dealing with one of those simple pipes out the back that we diverted to a ditch that had some intermittent water flow. We then stacked in lots of local plants to again give habitat for the water to be cleansed. In the urban context, innovative systems can be employed to stack in space and time. 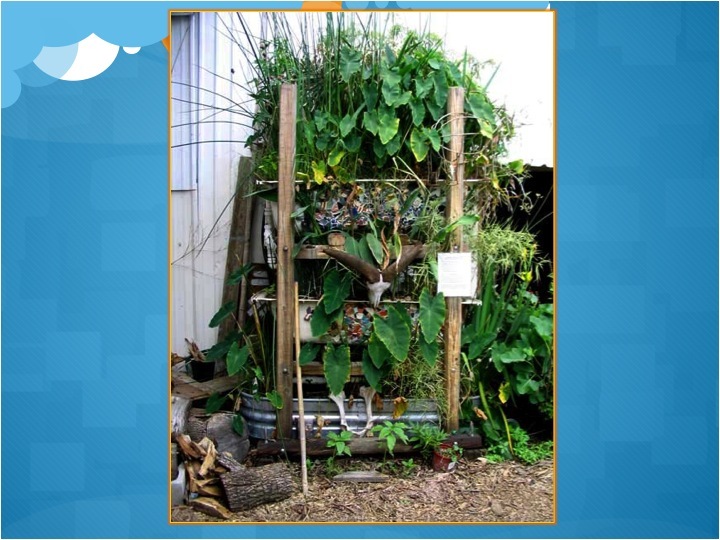 From the rhizome collection in Austin, Texas this example below is employed to take care of this water resource in a layered approach. It’s quite a beautiful resource with all those bathtubs just lying around waiting to be repurposed for sustainability needs. Instead of an earthwork to create the depression the bathtub is employed. I have seen other systems similar where I did my PDC in 2005, but the overuse of sand seemed to plug up the system for the kitchen greywater with all of its particulates. At the end of the day, these systems are simple, they are easily to maintain, and please don’t complicate it. Know that carbon needs to be added from time to time, plants propagated and observation and maintenance as the system matures. Hi Doug. Good information. One question though, how so we deal with very hot water like from a shower or dish washing? Can it go directly to a reed ve or a pond or a tree? Cheers. it seems to not hurt anything actually. even with boiled water poured out of pasta bowl I simply turn on the cold tap at the same time to balance it all. but yes it can either outlet to a reed bed or greywater with no worries. if the water doesnt hit plants right away then it cools pretty rapidly eh. beneath are vastly improved. However whats left behind is little roots in the soil. I believe digging it up and putting it through a garden sieve is the best approach and then planting a cover crop.